Action in the New Silvercity Secondary vs Private Schools Combined match. 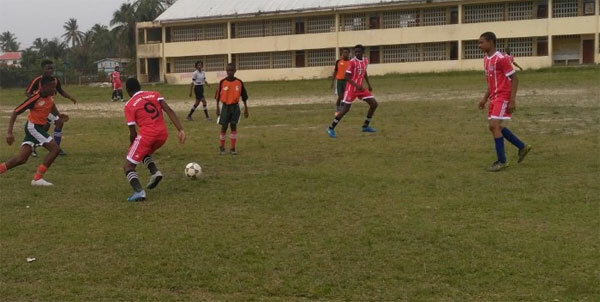 New Silvercity Secondary blanked the Private Schools Combined 10-0 while Mackenzie High School triumphed 3-1 over Harmony as group play in the preliminary rounds of the 10th Edward ‘Screw’ Richmond Memorial Linden Schools Under-18 football championship continued recently at the Wisburg Secondary School ground. In the first match, Kemuel Batson netted the opening goal for Mackenzie High in the 6th minute while Lebron Deflorimonte doubled the advantage in the 28th minute as they led 2-0 at half time. The lead was increased in the 46th minute through Lorenzo Miller’s strike but Harmony pulled one back in the 65th minute as Mackenzie High coasted home winners by a 3-1scoreline. In feature play, New Silvercity after a 6-0 half time advantage hammered Private Schools Combined 10-0 behind hat-tricks from Ojani Whittington (8, 10, 57) and Shane Haynes (18, 20, 34). There was a double from Emmanuel Atkins in the 14th and 38th minute while single strikes came from Huey Fraser (23) and Malachi Todd in the 70th minute. 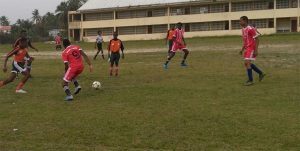 Also in winner’s row were home team Wisburg which stopped Linden Foundation 4-0 while Harmony Secondary edged Linden Technical Institute 1-0. In Wisburg’s in, Joel Isaacs netted a double in the 16th and 32nd minute while the other goals came off the boot of Leyon Jones in the 20th and Quacy Cadogan in the 31st minute. The lone goal in Harmony’s win against LTI was scored by Osafo Paul in the 18th minute.